1. In a small saucepan, cook quinoa as per usual. In another saucepan, boil sweet potatoes whole, until tender. 2. Whilst the quinoa and sweet potato are cooking, remove all seeds from pomegranate and set aside. 3. Remove quinoa from heat and leave lid on to cool. Remove sweet potato and chop. 4. In a large non-stick pan, heat coconut butter until melted. Add chopped sweet potato (both varieties) and cook until slightly brown and crunchy. Add salt and pepper here if desired. 5. In a large bowl, add cooked quinoa and 1/2 of dressing and mix well. 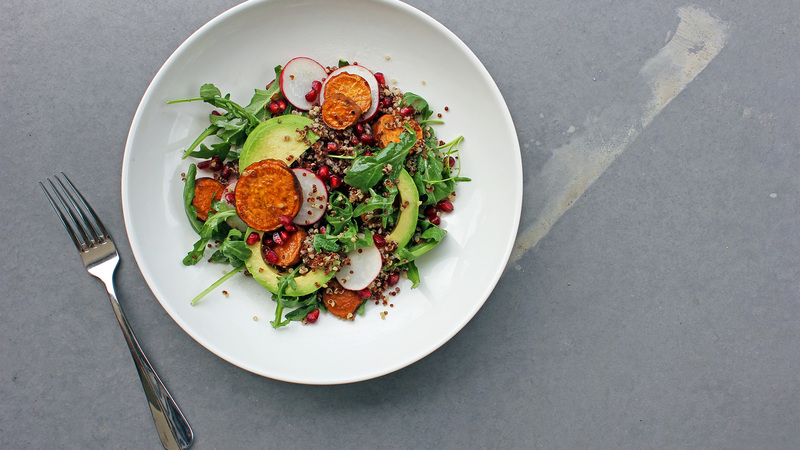 Add sweet potato and rocket, mix well, then top with avocado and pomegranate and remaining dressing.